Just what is the price for belonging and acceptance? What if one can never fulfill the requirements for being part of the society of the human race, no matter how gentle, law-abiding and meritorious one is, no matter what efforts others make to provide some integration? 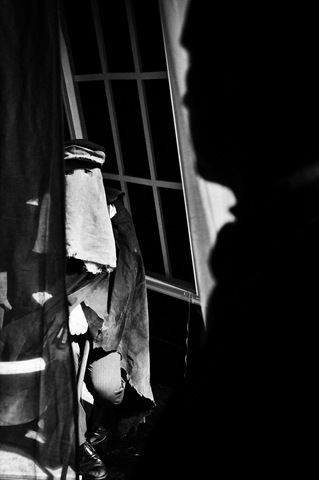 Bernard Pomerance’s The Elephant Man is unique in that it takes these issues to absolute extremes and forces us to see ourselves through its funhouse mirror. 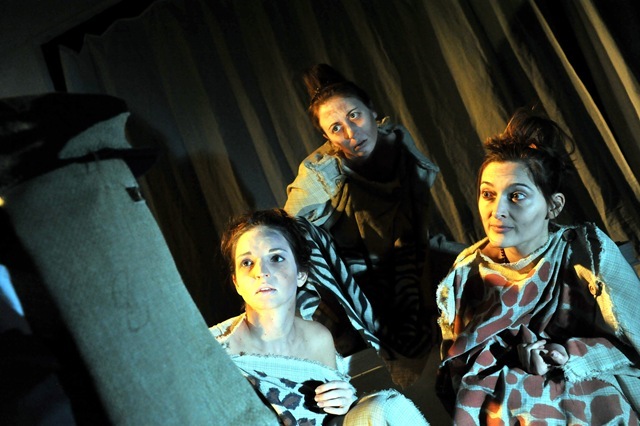 Boho Theatre has mounted an elegant, stately and psychologically mature production at Theatre Wit. June Eubanks’ direction adheres to the minimalist aesthetic and self-consciousness theatricality the play was born in, crystallizing poetically profound moments that elevate language much in the same way that John Merrick (Mike Tepeli) describes the effect of the uplifting architecture of St. Philip’s church. John Merrick, dubbed the ‘Elephant Man’, and his place in late Victorian society, is uplifted for our gaze. He is a man who can never stop being a spectacle; his life, trapped in outrageous physical deformity, is constantly at the mercy of what the rest of his fellow humans see and suppose of him. I can praise the excellence with which Tepeli assumes Merrick’s form, virtually pretzel-twisting himself into character at the beginning of each scene, but more excellent is the way he captures Merrick’s childlike, innocent acceptance of himself, of those around him and his lot in life. 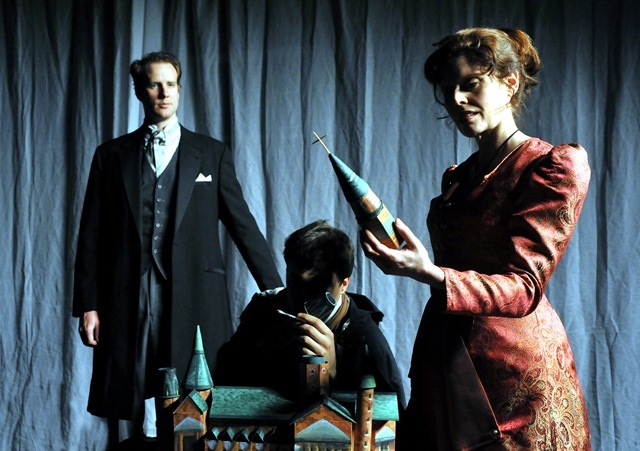 Just as powerful are Merrick’s moments questioning, from his bath, Treves’ notions of established order or the rush of intense emotion upon Merrick once he shakes Mrs. Kendall’s (Cameron Feagin) hand for the first time–or loosing her, on Treves’ orders. Tepeli has completely mastered his role, with assurance the audience can relax into watching how others respond to him. Likewise, Steve O’Connell’s Treves has all smooth and put-together bearing of a clueless do-gooder just beginning to realize how dubious his mercy towards Merrick is and how little he can do to alter the inequities between them. His relationship with Merrick seamlessly sets into motion Treves’ re-examination of his culture’s social inequality. 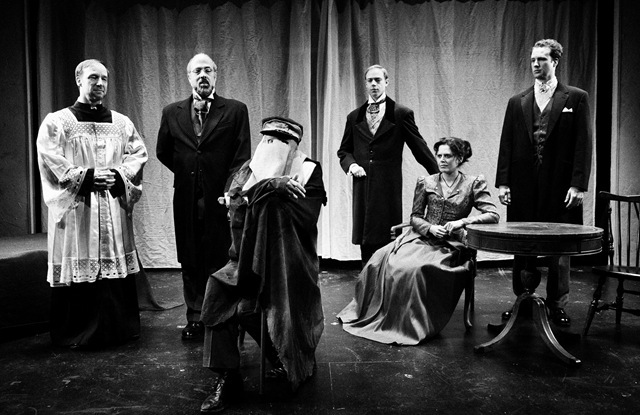 When he begins to crack under unbearable conundrums about his real value, as a respected member of the British Empire or as a human being, O’Connell sculpts Treves’ emotional downfall with intricate care–his breakdown in the arms of Bishop How (Thad Azur) is every bit the epiphany it is supposed to be. The same meticulous care can be witnessed in every aspect of Boho’s production—one of the more scintillating aspects being that the rest of the cast take on multiple roles and carve a unique, distinctive character with each role. Cameron Feagin indelibly etches both the horrified missionary Nurse Sandwich and the charmingly controlled and worldly actress Mrs. Kendall. Zach Bloomfield’s Ross is devastating, particularly when he comes begging to Merrick in the hospital for another crack at being his handler—Bloomfield and Tepeli could conduct an acting masterclass based on that scene study alone. Michael Kingston’s turn as Carr Gomm brings the right note of complacency to his foil for Treves—an administrator quite content to oversee Merrick’s care, so long as his freakish presence keeps the money rolling in to the hospital in donations from the upper classes. Indeed, the only flaws of the production may be its still awkward scene changes. Jill Vanc’s projection of scene titles and their announcement at each scene purposely heighten The Elephant Man’s theatricality. 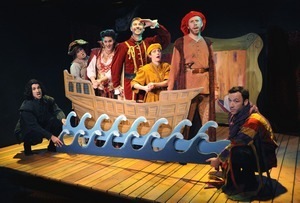 But upon opening the show still suffered some clumsiness in actors getting on and off through the transition—a problem that could be worked out in the course of the run. 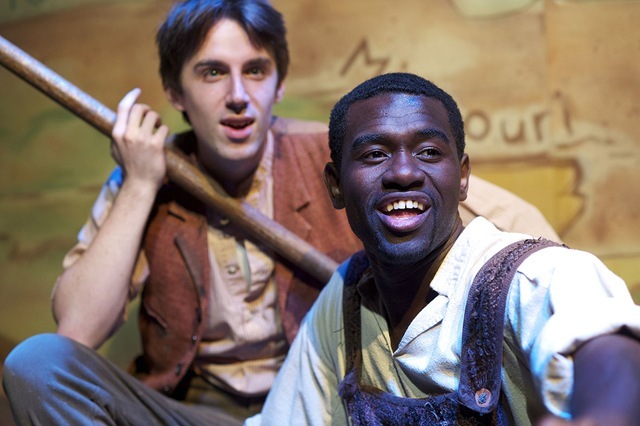 Widely considered the greatest American novel ever written, Mark Twain’s 1884 coming-of-age tale, “The Adventures of Huckleberry Finn”, received a lively musical treatment 100 years after its publication in Big River. 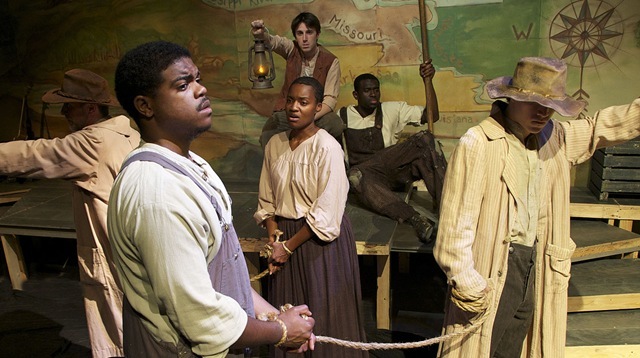 The Tony Award-winning musical, which ran 1,000 performances on Broadway, captures the charm and poignancy of the original, as we follow Huck and the escaped slave Jim down the "Muddy Water" of the Mississippi River, "Waitin’ for the Light to Shine" — as the songs put it. 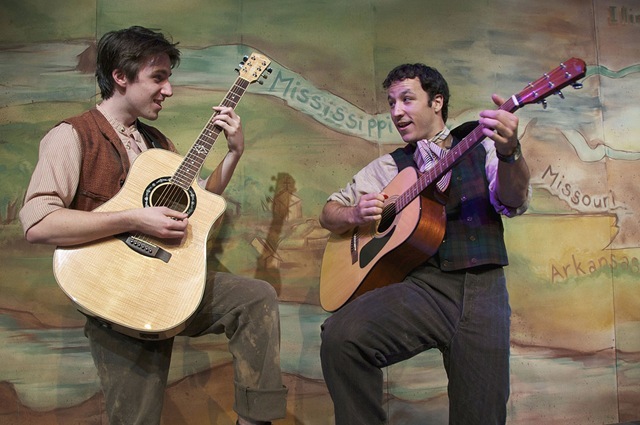 Although no stage production could possibly encompass all the nuances of Twain’s masterpiece, this well-cut adaptation by William Hauptman delivers the essence, paired with a fitting, catchy score by country-music star Roger Miller that blends foot-stompin’ bluegrass, powerful spirituals, vaudevillian comedy numbers and such memorable ballads as "River in the Rain." Bohemian Theatre Ensemble mounts a warm, intimate and beautifully sung revival in their handsome new home at Lakeview’s Theater Wit, full of bouyant humor and touching moments. Andrew Mueller gives us a gamin-faced, thoughtful Huck with a fine tenor. 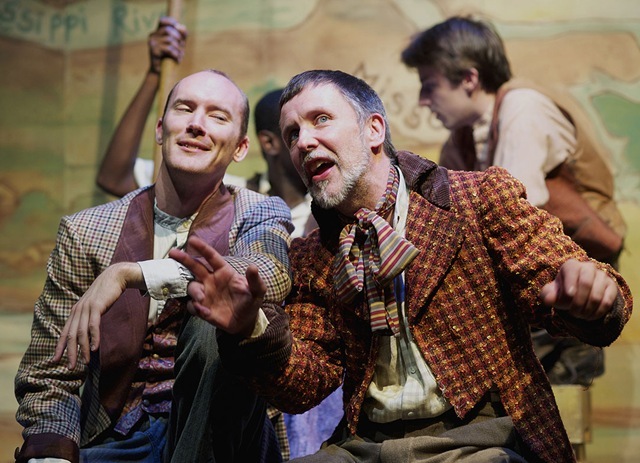 As Jim, the richly voiced Brian-Alwyn Newland provides the backbone of the music, smooth and soulful, combined with a dignified stage presence that reveals the mature and feeling man behind the tattered clothes and uneducated language of the slave. Sean Thomas makes a wicked Pap Finn, hilarious in his drunken denouncement of "Guv’ment," and a diabolical king and "Royal Nonesuch," aided by the elegant John B. Leen as the sly and histrionic duke. Courtney Crouse is boyishly mischievous as Tom Sawyer, always ready for adventure and adorable as he calls for a "Hand for the Hog." Rashada Dawan brings a soaring voice to gospel numbers such as "How Blest We Are," and Mike Tepeli adds a comic turn as the young fool, with a zany, washboard-accompanied rendition of "Arkansas." Much of the cast supplements the orchestra at different points, picking up guitars,box, or a tambourine to effectively back Musical Director Nicholas Davio playing a variety of instruments, Hilary Holbrook on fiddle and Cam McIntyre on bass. Davio and Holbrook also act small parts. 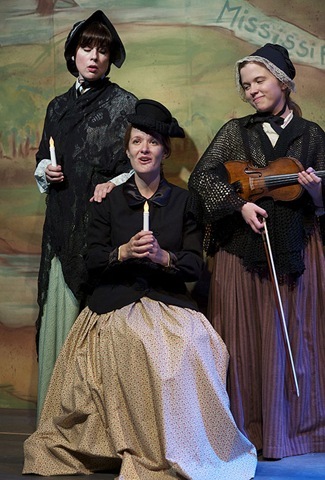 Christa Buck, Anna Hammonds and James Williams fill out the ensemble. Director P. Marston Sullivan’s deceptively simple staging and Anders Jacobson and Judy Radovsky’s stylized set put the talented cast and Twain’s potent story foremost. 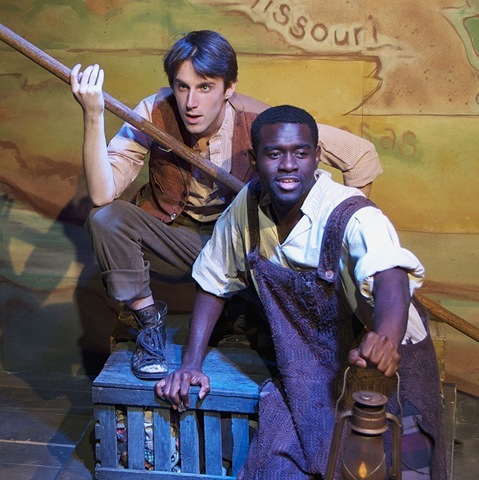 You don’t need to have read "Huckleberry Finn" to enjoy this musical, although everybody ought to read it … again and again. "It’s jaw-droppingly different," says Jeremy Wechsler, artistic director of Theater Wit, about his troupe’s new home. 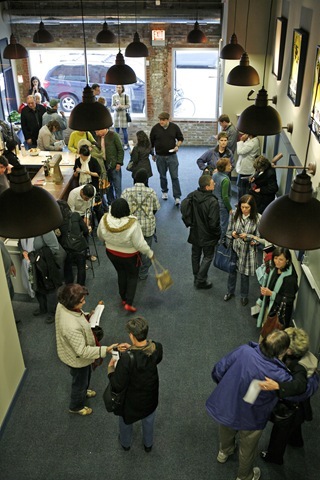 After 16 months of a $1.3-million joists-out renovation, the one-time post office adjoining Theatre Building Chicago is now the sparkling new Theater Wit, 1229 W. Belmont Ave. (map), a dynamic new multi-performance space. The building, most recently Bailiwick Arts Centre, still has a few i’s to dot and t’s to cross before the city of Chicago grants its Public Amusements Venue license. 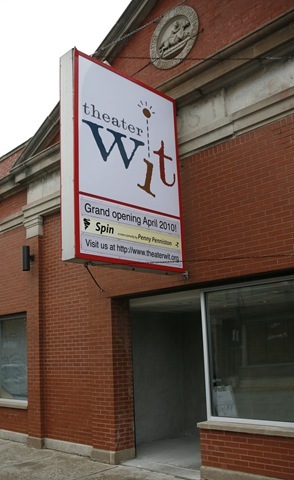 Wechsler expects it in mid- May; for now, Wit is running its inaugural play, Spin (our review ★★★), on a "suggested donations" basis. Valet parking isn’t in place yet, either, but for the time being, Wit has arranged free parking in the lot behind Cooper’s restaurant across the street. 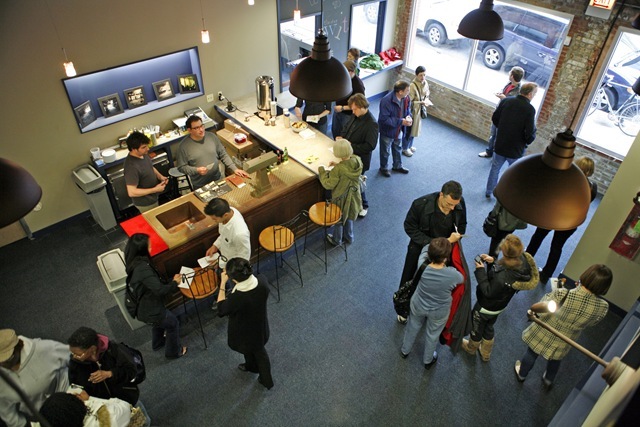 The building now houses three 99-seat black-box theaters, providing a new showcase for intimate local productions. "This is a size of theater that didn’t exist," Wechsler says. "There were (too small) 70-seat theaters, in which you could never turn a profit on a show, and (too expensive) 150-seat theaters … in which you could never turn a profit on a show. I really wanted this size of theater for myself." Along with Wechsler’s Theater Wit company, Bohemian Theatre Ensemble, Shattered Globe Theatre and Stage Left Theatre will share the space as resident troupes, contributing work to the building and using about 75 percent of the performance time, with the remainder available for rental. In the fall, once all the theaters are up and running, Wit will introduce a flex-pass arrangement for tickets to all productions. 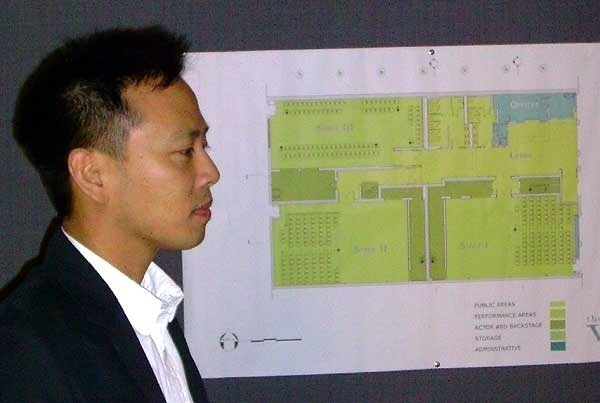 Architect Richard Kasemsarn explains that the theaters are cleverly separated by dressing rooms to create easy backstage access and keep sound from bleeding from one to the other. They are also insulated from exterior noise, save for occasional seepage through the brick wall from the adjoining Theatre Building. New metal joists support a variety of lighting configurations. 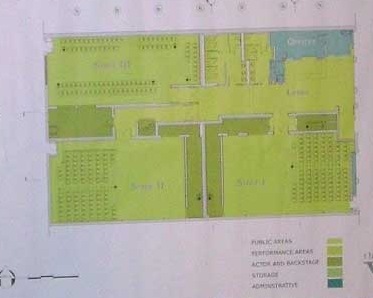 One of the three theaters will feature flexible seating, not yet installed. Seats in the other two, salvaged from a Bolingbrook high-school auditorium, are surprisingly wide and comfortable, and they’re spaced with reasonable leg room, although their incline and offset don’t quite keep tall people from blocking your sight lines. Architectural salvage provides handsomely quirky decorative elements through the space, although you won’t mistake this for a posh downtown theater. It does retain that hand-built, slightly rough quality common to Chicago storefronts. Kasemsarn, who teaches at the School of the Art Institute, recruited students to help with the finishing. The modest lobby features a bar, and the building has ample restrooms — a seven-stall ladies’ room should minimize lines at intermission. Oversized ductwork is intended to keep theater goers at comfortable temperatures without contributing noise. "I really want to control everything from the time you hit that lobby door," Wechsler says. The Heartland Studio, home base for the Bohemian Theatre Ensemble (Boho), is one of the smallest black boxes I have ever been to in Chicago. As you walk in off the street, you find yourself inside a box office not much bigger than a phone booth. Finding your seat in the theater is more like squeezing your way into a crowded elevator than getting ready to experience high art. And on Friday night, as the lights went down in that small, communal space, and the actors took to the stage to begin performing the regional premiere of Stephen Flaherty and Lynn Ahrens’s The Glorious Ones it was the least lonely place in the world. What could be better, on a cold Chicago night, than to see a group of young, vibrant performers fill a small space with their white hot energy? This is a far from perfect production, but the dedication and energy of this vibrant cast is a treat. Director/set designer Stephen M. Genovese has created a fine and audacious set; a blank old-world-looking wood stage dressed with simple red curtains and the occasional charmingly low tech surprise. It’s a set that screams, “Fill me! 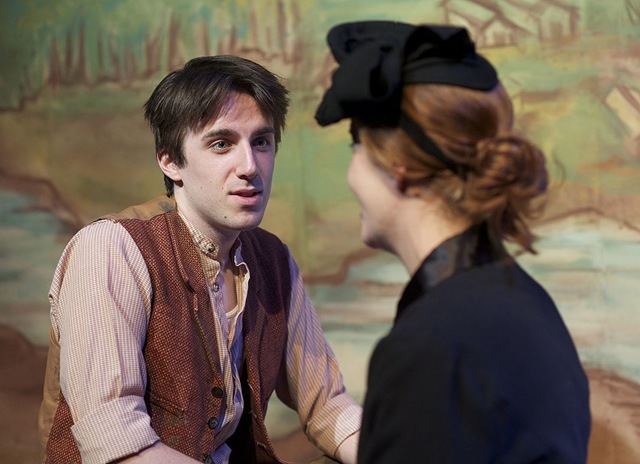 Bring the best you’ve got!” – and Mr. Genovese and his cast make a wholehearted attempt…and sometimes succeed. 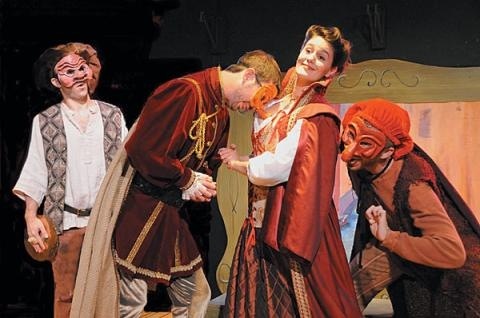 The play is set in 16th century Venice, during the creation of Comedia del’ Arte. “The Glorious Ones” are a Comedia troupe, led by the pompous and egocentric Flaminio Scala (based on a real-life Comedia performer) played by Eric Damon Smith. The scenes of actual Comedia are great fun. One sketch is repeated three times, as a mapping device for what we know is going on behind the scenes. The best though, is “Armanda’s Tarantella,” slyly performed by the fearless Dana Tretta. Most of the large group scenes have merit. “Flaminio Scala’s Historical Journey to France” is a showstopper, and highlights the energy and force behind these performances that make this show worthwhile. The thing the show is missing, and it is sorely missed, is honesty. The one-dimensional character of Flaminio Scala is prouder than proud and intensely serious. He speaks of his work with dignity and pride, and yet, seems to have no relationship with it. The man as a comedian is never explored, or even dignified with attention. In a pivotal scene, Flaminio embraces a struggling street performer (Courtney Crouse), after watching him perform, and takes him under his wing. Flaminio didactically spells out his lesson plan to build the young raw talent into his protégé. Here, Flaminio gets the opportunity to talk about his work; instead of reveling in it’s humor like a comedian, he discuses it with the wistful dreaminess of a school girl recanting her favorite lines from Twilight. Mr., Smith has the most stage time, and so bears the burden of being an example, but I assure you the lack of truth on stage was a cast-wide epidemic. From the audience, it seems that Mr. Genovese focused too intently on the larger than life aspects of the show and forgot that a show needs honesty to be relatable. About two-thirds of the way through, Danni Smith as Coloumbina breaks the monotony of disconnected energy and hits one out of the park with “My Body Wasn’t Why,” an empowering and tear-jerking ballad about art, aging and womanhood. Lynn Ahrens’s interesting book races through the first half of the show, asking the audience to simply accept the characters without working for it. In the second half of the show, when the action finally slows down, it is difficult to muster empathy for anyone. The wonderful thing about it, though, is the subject matter. 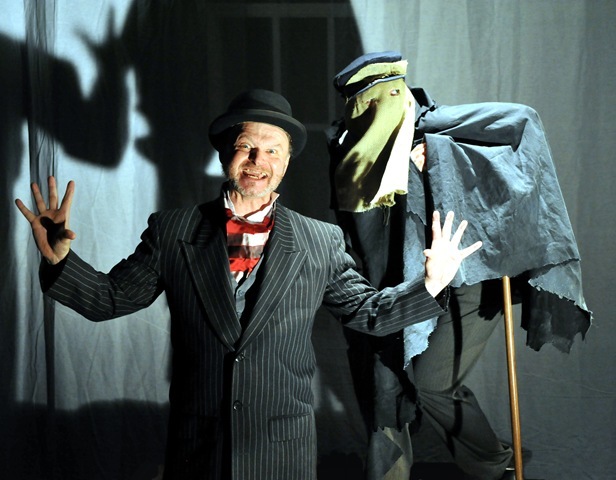 We are invited to experience the creation of Coloumbina, the sassy maid; Pantalone, the miserly old man; Dottore, the quack doctor, and Harlequin, the sly prankster, which is a real treat for a theater lover. Stephen Flaherty’s music is full-bodied and emotional, and paired with Lynn Ahrens’s lyrics makes for a great soundtrack. It is in this partnership that these two create strong work, but Lynn Ahrens’s book independently leaves much to be desired in terms of character development. The thing you have to do to enjoy this show is to understand that it is not a musical comedy. It is a musical about comedy. But the entire cast invites you warmly into their view of history, and you get to see a neat, shiny version of the creation of an art form. If you are a comedy lover (who isn’t?) go see this show. It’s a musical about the creation of something really important, and it is worthy of your attention. For a theater lover, this production is a historical journey worth taking, even if there are a few unintended pratfalls along the way. Tickets must be reserved ahead of time by emailing producers@101datessf.com. 101 Dates, a new comedy by Bay Area resident David Rodgers Jr, has had staged readings throughout Northern California, and continues the tour in Chicago and New York. What started out as a journey to find love has turned into a two-and-a-half-year project in which David went on one hundred and one dates! He’s dated men, women, an ex-Catholic priest, and even a celebrity. 101 Dates is a satire of contemporary dating for all audiences, gay, straight…or whatever. David recreates the best-of-the-best of the 101 men, women, men who used to be women, and women who used to be men he’s met in his quest for love. The show features multi-media elements such as digital film segments, animation, and the spirited people of San Francisco sharing opinions of popular love songs, pick-up lines, and love. In addition to the show, a new website has been launched; www.101datessf.com where people can read David’s blog, share dating stories, and ask dating advice. 2008 After Dark Awards Announced! For the complete listing of all 2008 After Dark Awards, including full descriptions and great pictures, go to my friend Venus Zarris’s theatre blog: www.chicagostagereview.com. Go Venus! !